HAUPPAUGE, NY--(Marketwired - Sep 30, 2014) - Summer is over on Long Island, but don't fret. Fall is one of the best times to visit -- our coastal climate keeps things a bit warmer than the rest of the continent, so the leaf peeping season extends well into November. Rates at quaint hotels and B&Bs drop substantially in the off-season and you might even get a table at that trendy Hamptons restaurant you've been dying to try. But the most anticipated part of the season is the fall festivals. Find a full schedule of events and check out some of our favorites below. 10/16/2014 - 11/02/2014. Extravagant jack o'lanterns and sculptures created by professional artists. 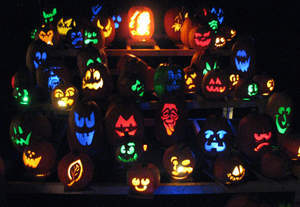 A mutli-sensory experience featuring hundreds of lit pumpkins.